Since gorillas seem to be popular lately, (see my recent post, this one from Laelaps and here in the news) I had little choice but to feature them as this week's Monday Mammal. Below, I'll first introduce the different gorilla species (yes, there are more than one!) then cover where they fall in the list of our closest primate relatives. Figure 2. 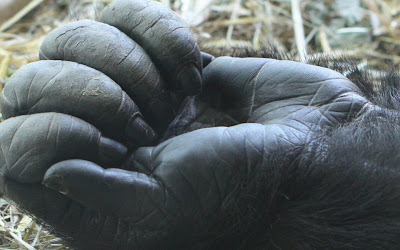 Hand of a female gorilla, napping at the Denver Zoo. fragile bodies I'm have to be suffering with major thumb envy! Gorillas are comprised of two species: Western Gorillas (Gorilla gorilla) and Eastern Gorillas (G. beringei), which each include 2+ subspecies. Gorillas are endemic to Africa, with the Westerns being the more populous of the two at about 95,000 individuals. Just to confuse the common names a bit, the most numerous subspecies within each species is the "Lowland" subspecies... let me clarify. Western Gorillas include two subspecies: the nominate Western Lowland Gorilla (~95,000), and the critically endangered (~300) Cross River Gorilla (G. g. diehli) which lives along the border regions of Nigeria and Cameroon -- the most northerly part of the Western Gorillas' range (see map below, also click Terrain View for topological details). The site www.crossrivergorilla.org has additional information on this subspecies. Figure 3: Range of the Western (orange) and Eastern (yellow) species of Gorillas. The Cross River Gorilla population is the northern most orange dot on the map. The Eastern Gorilla is also currently split into two subspecies: the more common (~5000) Eastern Lowland Gorilla (G. b. graueri) and the much less common (~700) Mountain Gorilla (G. b. beringei) which itself may actually consist of two separate subspecies. 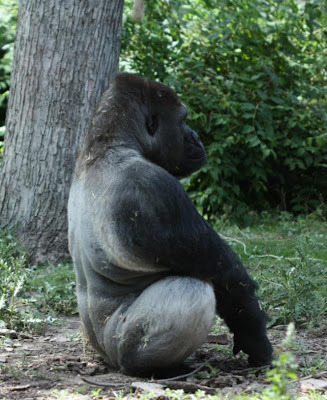 How related are humans and gorillas? As I've mentioned previously, most people have only a foggy understanding of our kinship with other primates, and know little of our place among our closest group of related species, the great apes. Most know our closest living relative is the Common Chimpanzee (Pan troglodytes), which would make the Bonobo (Pan paniscus) our second closest relative. Perhaps less widely known is the fact that from the chimps perspective, they are more closely related to humans than they are to our third closest relatives, the gorillas. Once thought to only include Homo sapiens, the family Homonidae now also includes chimps, gorillas and the orangutan making us every bit as much great apes as they are. To clarify where the orangutans fit in, within Homonidae, there are to subfamilies: Homininae, the one we and the chimps share with gorillas, and Ponginae, the one occupied by only by the orangs. I'll leave you to work your way up the primate taxonomic tree from there. Our superfamily (Hominiodea) is made up of the great apes mentioned above along with the lesser apes comprised of the 4 genera (~13 species) of Gibbons. Next come our cousins the old world monkeys, then the new world monkeys, then the 9 or so species of tarsiers, and so on down the branches of the tree of life. Footnote: If you haven't already seen it, do check out the video embedded in my recent post and see if you maybe notice how some of that which makes us so uniquely human, perhaps isn't so unique after all. Thanks for the interesting and informative post. However, chimps and bonobos are equally closely related to us. They are both our first cousins.